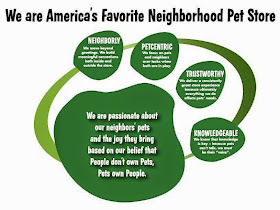 Pawsitive Impressions: A NEIGHBORLY Conversation Leads to a Unique Opportunity! A NEIGHBORLY Conversation Leads to a Unique Opportunity! Amber, Store Team Leader in West Lake, OH, doesn't miss an opportunity to chat with her neighbors when they are shopping. About two years ago, Amber met Deb, who had skunks on her shirt and a car dressed up as a skunk. Amber wasn't going to miss the opportunity to find out what this was all about! After learning about Deb’s love for skunks and that she owns a non-profit rescue organization for skunks, Amber asked Deb if she would like to educate her neighbors about skunks. Deb welcomed the opportunity to set up a table on the weekends. The relationship grew over the years. Amber noticed Deb purchased Natures Variety frozen and dry food for her shelter. Amber got together with the vendor representatives for coupons. Amber decided to set up donation funds by having neighbors purchase cans at the register to help this local shelter. Deb was so touched by Amber and her team’s efforts to help this petcentric cause. Deb was contacted by Discovery Channel a couple weeks ago to do a feature on her Skunk Haven non-profit organization. The first person Deb called was Amber to have the filming done in the Pet Supplies Plus store. The feature will be aired in the upcoming months- stay tuned! This story goes to show that you never know where a NEIGHBORLY conversation can go. Clearly this conversation has turned into a mutually beneficial friendship and long-term partnership. Pat on the back to Amber! A Lasting First Impression in Fishers, IN! PETCENTRIC Leader to the Rescue!